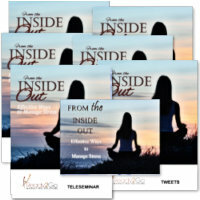 Tweets: From the Inside Out - Effective Ways to Manage Stress from Ready2Go Marketing Solutions, Inc.
To manage stress, change your internal dialogue to positive, reframe the situation and look for “what’s right” about it. Stress is not what happens to us. It's our response to what happens that creates stress. And our response is something we can choose. Stress management is NOT spending time planning tomorrow's schedule or doing chores around the house. Do something special for you.